Looking for a Change of Name service? You can avail our Package and we will provide you full service for Changing your Name, Publication in Newspaper till Notification in Gazette of India. Creation of Affidavit – An affidavit needs to be prepared for the name change. Newspaper Advertisement- Place advertisement in Newspaper with the details of change of name. Gazette Notification- A notification should be published in the Gazette of India (Part IV) regarding the Name Change. After completing this, the second step is Newspaper Publication for Change of Name. Publish the Advertisement in two local leading newspaper of the State i.e one in the Regional Language of the native state from where the applicant belong and one in the English leading newspaper and preserve at least 4-5 original copies of the Newspaper. 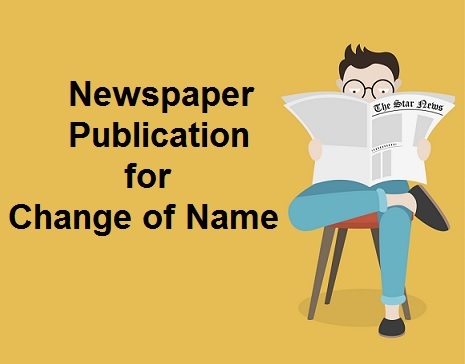 After placing the advertisement in newspaper now Publish the Notification in the Gazette India about the Name Change and preserve the copy of notification with you and use it at the places where you want to change your name. Publication in Gazette of India is not mandatory in all the states, it depends upon the State to State, while its mandatory for Government Employees to draft the Name Change Deed and to publish the notification of changing name in Gazette of India. If you want to save your time and efforts eDrafter.in brings its Name Change Package for you. Just avail our services and there will be no need to rush and face the queues and press of people, we will do the Job on your behalf.